Active8 Robots offers expertise in robot programming whether it’s an industrial solution or collaborative robot cell. Robot programming can be a daunting thought for clients, which is why Active8 Robots offers full programming and training for all solutions by our programming experts. A collaborative robot, such as Sawyer, has been purposely developed to be usable by non-experts which are trained by demonstration and not programmed. On average it takes 2 hours to train Sawyer in any given task. 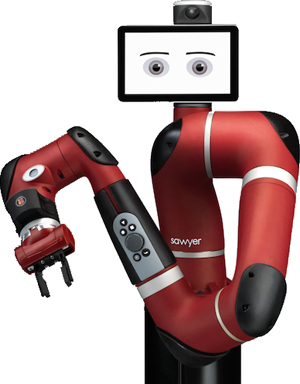 Collaborative Robots, such as Sawyer, have been developed with ease of use in mind and are usable by non-experts through its training by demonstration model, rather than traditional programming paradigm. Sawyer with its ground-breaking Intera software can be treated as a next-generation power tool, making high-performance robot automation as simple to use as a smartphone. To train Sawyer you can take the robot by the wrist and move the arm using “Zero-G” mode, this makes the arm support its own weight but allows you to manipulate the joints freely to train a position. Through showing Sawyer a series of positions and indicating what the robot should be doing at each one (eg: Grasping, Releasing etc) a full robot program can be trained very quickly. Sawyer features a number of input “Navigators” used to select features and options from the simple and intuitive menus onscreen, allowing complex interactions to be inputted very simply. Intera also features “common-sense”: Sawyer can sense if it drops an item, collides with a person or object, and adapt to semi-structured environments; this makes Sawyer safe to work around without cages. allows for rapid training of tasks and the flexible redeployment of Sawyer around your manufacturing site. 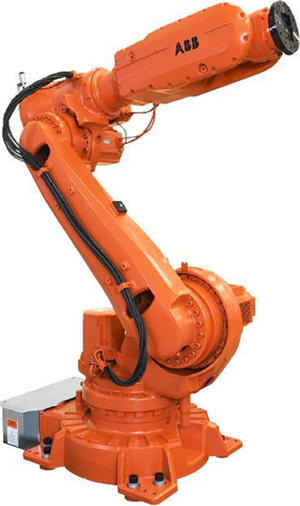 The control system of an industrial robotic arm will vary from manufacturer to manufacturer and model to model. Typically an industrial robot will require specialist programming and integration and this process will take on average 200 hours plus. Most manufacturers of robot hardware also provide their own software; while this is not unusual in other automated control systems the lack of standardisation of programming methods for robots can pose certain challenges. For example, there are over 30 different manufacturers of industrial robots, so there are also over 30 different robot programming languages! Active8 Robots provides a full rounded service to include programming of your industrial solution through to training of staff to ensure routines can be easily accessed. Our experts can provide this service on all industrial robots currently available from ABB and KUKA through to Fanuc. Please give our team a call now to discuss your specific requirements. Not sure which robot is the best fit for your automation project, get in touch with one of our specialists.